Today is the 3rd day of Microsoft’s 12 Days of Deals promotion at their physical and online stores and it is another great offer. 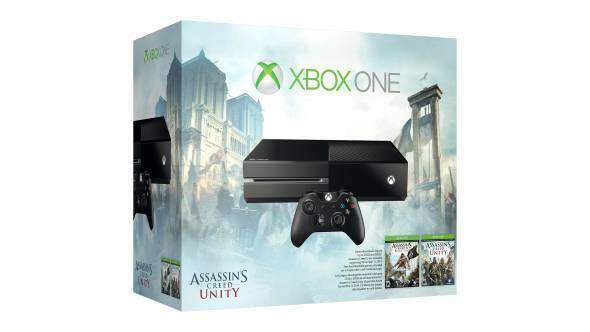 Today only at the retail locations you can get the Xbox One Assassin’s Creed bundle for only $349. The offer comes with the Xbox One console with a 500GB hard disk, wireless controller and headset along with two Assassin’s Creed titles: Assassin’s Creed Unit and Assassin’s Creed IV: Black Flag. In addition, you get to chose a 3rd game with your purchase which can be a wide range of games but generally is a $59 value. For those of you who don’t have a Microsoft Store nearby or who do not want to fight the crowds, you can shop online and get the same price but with only one game title. The 12 Days of Deals has been a reasonable success so far and I suspect today’s deal will be successful for Microsoft. Yesterday’s BLU Win HD Windows Phone deal sold out completely. The Xbox One Assassin’s Creed bundle goes on sale at your local Microsoft Store at 8AM and starts online at 8AM EST.